York is a town in York County, Maine, United States, near the southern tip of the state. Start off your visit on the 1st (Thu): get outside with Fisherman's Walk and then enjoy the sea views from Cape Neddick Nubble Lighthouse. For other places to visit, photos, and other tourist information, you can read our York route planning tool . Chicago to York is an approximately 5-hour combination of flight and car. You can also do a combination of flight and bus; or drive. The time zone changes from Central Standard Time (CST) to Eastern Standard Time (EST), which is usually a 1 hour difference. Expect slightly colder evenings in York when traveling from Chicago in August, with lows around 60°F. Wrap up your sightseeing on the 2nd (Fri) to allow time to drive to Bar Harbor. Bar Harbor is a town on Mount Desert Island in Hancock County, Maine, United States. 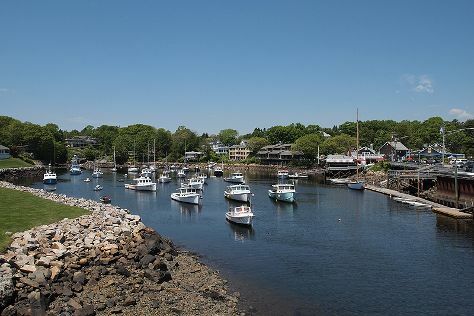 On the 3rd (Sat), contemplate in the serene atmosphere at St. Saviour's Church :, then head off the coast to Mount Desert Island, and then see majestic marine mammals with a dolphin and whale watching tour. Get ready for a full day of sightseeing on the 4th (Sun): take your sightseeing to a higher altitude at Cadillac Mountain and then identify plant and animal life at Shore Path. For where to stay, maps, other places to visit, and more tourist information, read our Bar Harbor tour site . You can drive from York to Bar Harbor in 4 hours. Alternatively, you can do a combination of bus, flight, and car; or take a bus. Expect slightly colder weather when traveling from York in August: highs in Bar Harbor hover around 75°F, while lows dip to 57°F. Wrap up your sightseeing on the 4th (Sun) early enough to travel back home.